Home / Other / CAN YOU FIND THE PANDA HIDDEN IN THE SNOWMEN? 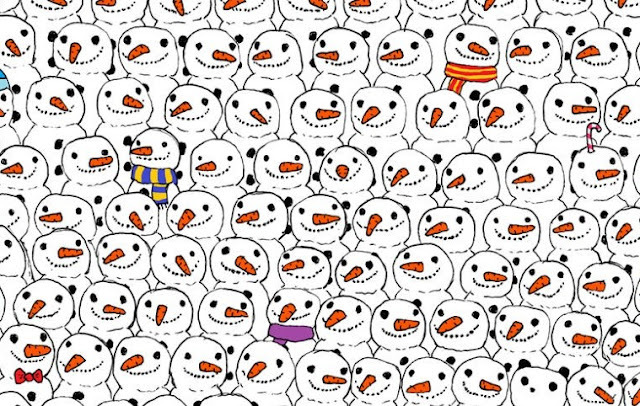 CAN YOU FIND THE PANDA HIDDEN IN THE SNOWMEN? I love pictures where you have to find things. I Spy andWhere’s Waldo were some of my favorite books when I was little. I would sit there for hours and look and look until I found Waldo hiding among vikings or at a renaissance festival. I would also see quite a few things that would make me laugh. Where’s Waldo is not “G” rated. 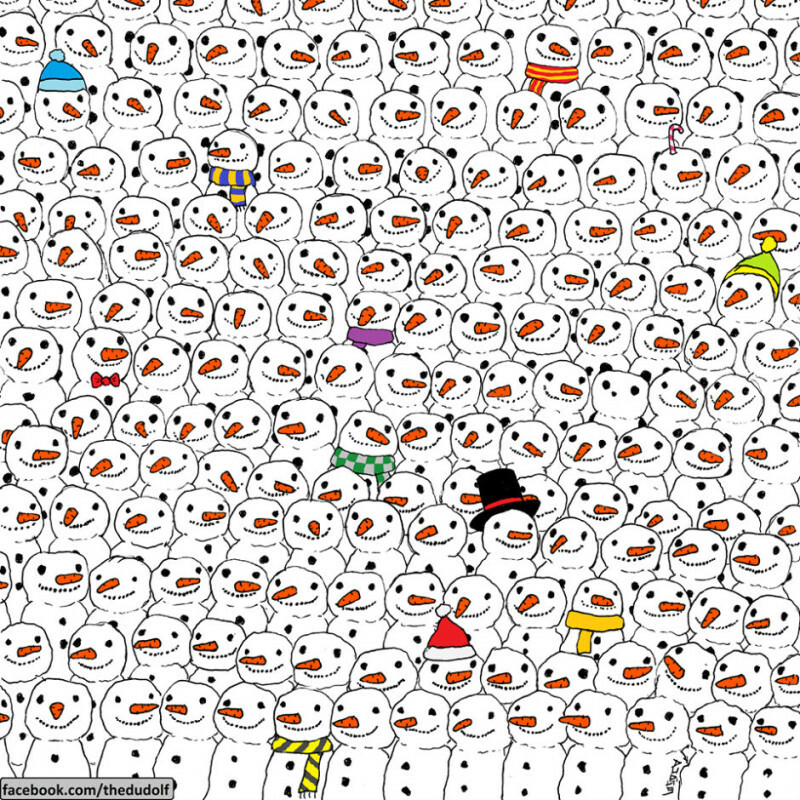 So, when I saw this picture from Dudolf, I jumped at the chance to find the panda bear in the snowmen. People said it was difficult and I was excited for the challenge. Gergely Dudás posted this picture on Dudolf on December 16th. He is a Hungarian artist, and when I scrolled down to see some more of his work, I was very amused. He gained a new like that day for sure! He captioned his illustration: “There’s a panda amongst them! Can you find it?” That challenge sucked me in, and I was ready to go. 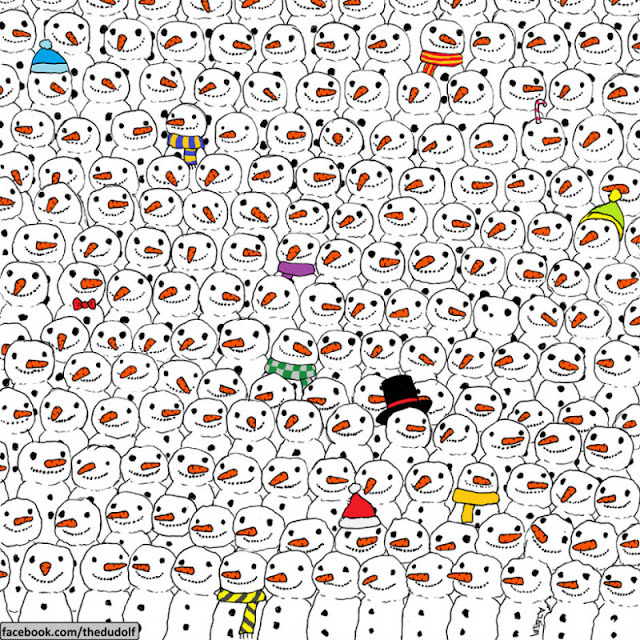 Try your luck with the snowman picture below! He also drew up an owl one with a hidden cat. This one may be a bit more difficult. In the end, it did not take me much time to find either. The fact that all the figures were in rows made it easy for me to track where I was and what I had looked at previously. Also, all that time I spent, as a youngster, searching for Waldo has prepared me for this task. These images are a type of optical illusion. Because the panda and the cat look so similar to the snowmen and the owls, it is easy for our brains to naturally pass them over. The brain will take the image of the panda, say, “that is close enough to a snowman, it has to be a snowman”, and make it a snowman in your head. That is why some people will stare at these pictures for minutes without finding what they want to find. All that time with Waldo has strengthened my visual perception skills which is exactly what these types of optical illusions are meant to do. If you enjoyed the images above, take some time to check out Dudolf. His work is truly comical! 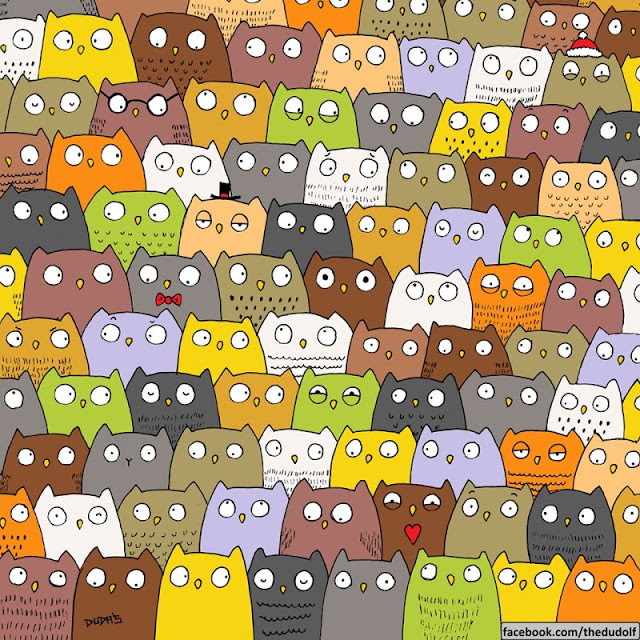 Did you find the panda and the cat? Check out this video below for a bit more fun! 20 Million People Talking about This.